Remember that old saying that humans only use 10 percent of their brains? If that’s true, we must be using even less of our Macs’ brains. 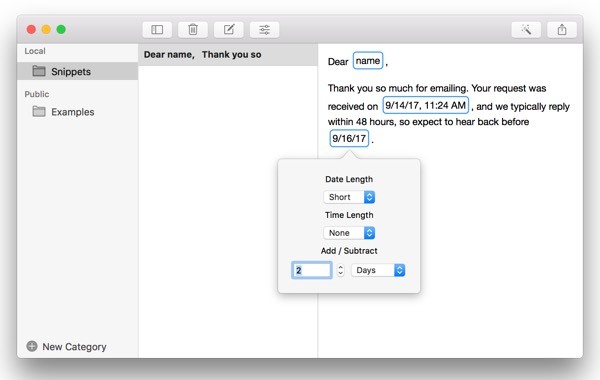 We wind up typing the same things over and over—your name and address in a form, your email address, directions to your house, your phone number, your preferred email sign-off—when we should let our Mac handle it instead. That’s where Rocket Typist comes in. How do you save and recall commonly used text clips? Rocket Typist is a new Mac app that lets you save snippets of text that will expand when you type a shortcut. 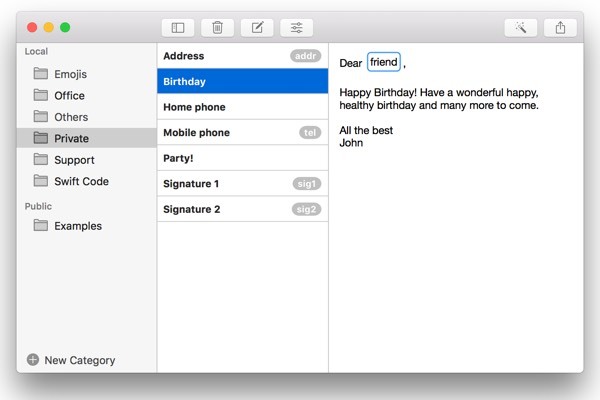 If you already use the wonderful TextExpander app by Smile Software, this probably sounds familiar, and it should. Well, Rocket Typist is a standalone product, it stores all your snippets locally, and it was just added to Setapp, giving you even more value for your Setapp subscription. We think you’re going to love how much time it’ll save you. Everyone has to type things, and most of us wind up typing a lot of the same things again and again. Your name, your phone number, your address, email, but that’s only scratching the surface. You could keep snippets for the answers to questions you get a lot, the template of a report you have to compile every week, code snippets you use frequently, words you’re constantly misspelling, or for anything you find yourself copying-and-pasting a lot. Think of Rocket Typist like a permanent clipboard, and use text expansion in your daily workflow - save your frequently used texts and templates to boost your productivity. Rocket Typist hangs out in your menubar, and it’s actually quite flexible in how you can use it. Store snippets to access manually. You can simply store text snippets in Rocket Typist’s Snippet Editor, and access them manually by clicking the rocket icon in the menubar. There, you can search for your snippet, and click it to copy it your clipboard. Then you can paste it anywhere you like. You can also find snippets with Spotlight, or set up a key command to open the menubar menu in the Preferences. If you’d like those copied snippets to auto-paste into your document as soon as they hit your clipboard, head to the Preferences, click the Auto-Paste tab, and check the box to Enable Auto-Paste. The sound is optional. The typing shortcut option makes Rocket Typist tremendously useful. Instead of having to search for and select your snippet manually, you can create a text expansion rule. Then you can just type the abbreviation, and the snippet will appear automatically. To turn this on, head to the Preferences, click the Abbreviations tab, and check the box to Enable Abbreviations. After you type an abbreviation, you need to hit one more key to make it expand to the full snippet, and you can choose the space bar, Tab key, or Return. This feature allows you to automatically fill frequently used long sentences with short abbreviations or keyboard shortcuts. For your abbreviations, you should pick a string that would never appear naturally in a word. I like to just add an X to the end, so for example, to type my address, I use the abbreviation addx. 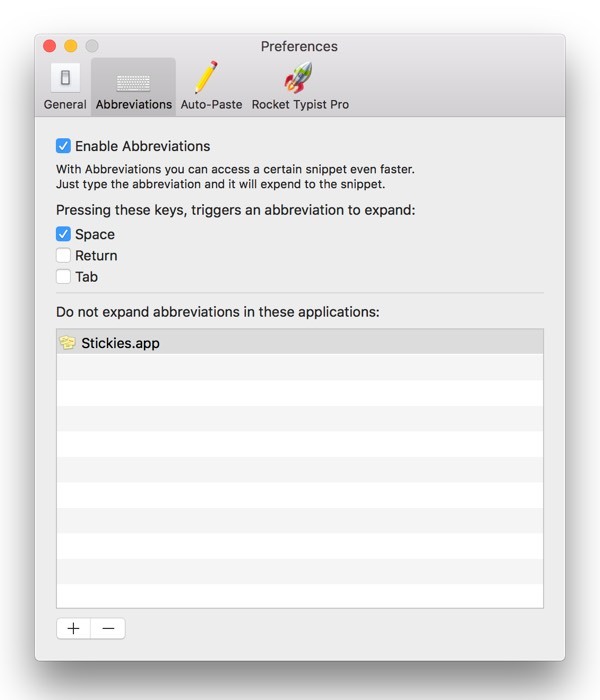 But if I found myself accidentally typing that in another application (maybe data entry, or when playing a game), Rocket Typist lets you exclude applications from your abbreviations in Preferences > Abbreviations. Open the Snippet Editor, and when you’re composing a new snippet, you can click the little magic wand button at the top-right for more options. They let you set up more complex snippets that you can use as templates for email replies, reports, and more. Date and time. You can add a placeholder for the date and time, and then format exactly how you want it to look. Then when you expand that snippet, the current date and time are filled in just how you like them. Placeholder text. You can also have placeholder text, which you’re then prompted to replace when you expand the snippet. For example, you could set up a snippet as a reply to an email, keeping the opening and closing chit-chat the same, and just inserting some custom text into the body to answer the person’s real question. Clipboard content. Maybe you get a lot of emails that require you to look something up. You’d probably copy the info, and then paste it into a reply, right? Rocket Typist lets you save the template for that reply as a snippet, and then use the Clipboard Content option to auto-paste in whatever is currently on the clipboard. Images. Your snippets can even contain images, so your email signature could have your company’s logo, or you could just keep a recent image of your kids handy to send to people who ask after them. Just drag images into the Snippet Editor. Give Rocket Typist a spin, and we think you'll be impressed with how much time and effort it can save you.